Trumpeter, flugelhornist and composer Jamie Breiwick is one of the most talented and inspiring musicians I’ve met in quite a while. He’s a major force in Milwaukee’s surprisingly strong new generation of jazz musicians and educators. So I’d like to alert all of this blog’s readers to his brand-new album Spirits, recorded at the Jazz Estate in November and released on the Chicago-based Blujazz label.(blujazz.com). 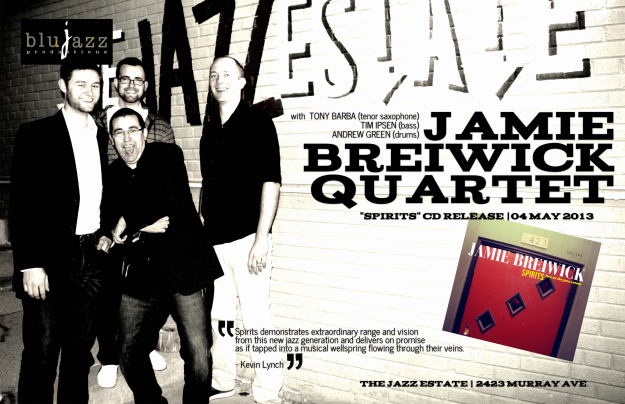 Jamie’s quartet will perform at a CD release party for Spirits at 9:30 p.m. Saturday at the scene of the recording, The Jazz Estate, 2423 N. Murray, on Milwaukee’s eastside. Open the door on the album cover and you enter the Jazz Estate, a Milwaukee club that exemplifies a venue that nurtures modern straight-ahead jazz and makes money at it. This recording was made there one night, even if the program has the well-considered sense of purpose of a studio recording. “Safe and Sound,” by country-pop artist Taylor Swift, is another strong and pliable melody that tenor saxophonist Tony Barba builds from close, pinprick-sharp variations until he unfurls some Joe Henderson-like flag-waving. Breiwick’s own “Little Bill” is a funky, amiable tune that honors the memory of his Grandfather Bill and also refers to The Bill Cosby produced cartoon of the same name, which Breiwick’s children love to watch. “Dad” adopts a slightly gruff tone and Barba is almost flippantly offhanded, befitting the sit-com mood. This band has a svelte-but-sure grip on the harmonic and rhythmic tension of “Capricorn,” a Wayne Shorter theme that seems to move in two directions at once while flowing as a seamless melody — characteristic of Shorter’s ineffable compositional genius. If that sounds like a chops-busting practice-room etude, “Capricorn” rises like an indelibly hummable melody. The band swings hard out of the gate, as Barba plunges in with pithy Shorterisms — slanting shards, open-throated exhortations and quotes of the sorcerer-like theme. Breiwick shifts gears with mute in bell, then creeps into a softly growling, splattered tone that recalls Don Cherry. He’s clearly finding his own forward-pushing place in the trumpet tradition. Bassist Tim Ipsen steps in like a heady middleweight contender, with a sly combination of punchy harmonic intervals. “Walk” opens with swelling mallet rolls and cymbals. The two horns resound like one voice, or mind, experiencing a revelation. Then everyone pulls back, as if in a slight state of awe, to contemplate the implications of the “Eureka” moment. One imagines a lightning bolt having struck the narrative consciousness right at its precipitous leap from daydream to nightmare. It recalls John Coltrane’s more pensive lyrical moments in his late years, when he pushed the spiritual-empowerment envelope like the shaman Dr. King might have met on that windswept mountain top. I hope to see you at the Estate Saturday night.